Tongariro National Park is located in the central North Island, the location is generally refered to as the "central plateau", and is located about 15km south of Lake Taupo. Turangi is the major town to the north (20km by road), National Park to the west, and Ohakune to the south. The Park is surrounded by State Highways, with the main trunk railway passing through Ohakune and National Park. Tongariro is perhaps the best known of all NZ National Parks. The three spectacular mountains of Tongariro, Ngauruhoe and Ruapehu rise out of the surrounding plains to dominate the skyline. Both Ruapehu and Ngauruhoe are active volcano's, with eruptions from Ruapehu being common place these days (last eruption June 1997). The volcanic landscape is simply awesome, walking amongst these "alive" giants, makes one very respectful of the might of Mother Nature. Lava flows, extinct & live craters, iredescent lakes, mountain streams, stunted forests, hot springs and absolute desert, are just some of the features waiting the day or overnight tramper. There are ski-fields at Whakapapa and Turoa on the flanks of Mt Ruapehu. Ridge Walk (40min) -Good views of Village, Ngauruhoe and the west. Taranaki Falls (2hrs) -Lava Flows, Stream, Alpine Vegetation, Hut, Waterfall. The Round the Mountain Track (a figure 8 network of tracks through and between the high peaks) provides the main tramping opportunity in the Park. Huts are well equipped, and well placed. The track passes through the most spectacular landscapes in the Park. Trampers can choose everything from long one day to 12 day tramps, dependant on your entry point to the Park. 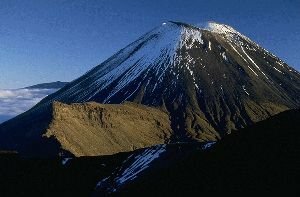 Tramping can include ascents of Mts Tongariro, Ngauruhoe and Ruapehu. In winter conditions can become hazardous on higher ground, with deep snow drifts and some avalanche danger on the steeper slopes. Ohakune, National Park, and Whakapapa Village provides most forms of accommodation to suit most budgets. In winter book ahead, as the ski season causes a lack of availability. Ohakune provides limited services, including banking, hire equipment, and groceries, National Park provides simple services such as groceries and hire services. Most small towns provide a limited array of "eating out" options.